If you are looking into having the carpeting and the rugs in your home professionally cleaned, you have probably given very little thought to the type of equipment that will be used throughout the cleaning process. Our professionals use truck mounted equipment to take care of your carpets and rugs, and there are some distinct advantages that Mill Creek, WA Truck Mount Steam Cleaning provides. One of the biggest issues that most people have when they attempt to clean their carpets at home is the length of time that it takes for their floors to dry, and the risk of their floors becoming havens for mold and mildew. Our Mill Creek, WA Truck Mount Steam Cleaning System cleans more thoroughly than portable cleaning methods, and the drying time is much quicker, as the suction is much more powerful. One of the biggest hazards that goes along with portable carpet and rug cleaning methods is the risk of spillage. Our equipment separates cleaning chemicals and wastewater from your home, because we do not have to deal with the issue of having to constantly to empty our canisters which could increase the chances of accidental spills in your home. We have 3 different packages that we offer. 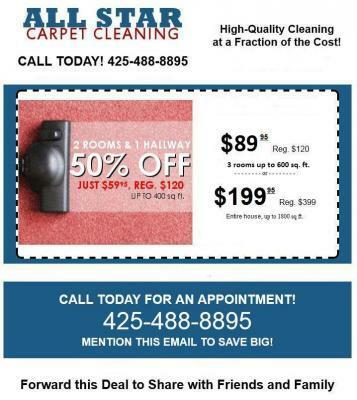 If you have any questions or would like to schedule an appointment, give us here at All Star Carpet Cleaning a call 425-488-8895.